Welcome to the October, 2016 issue of GL Communications' Newsletter providing information and insight into our test, simulation, and monitoring systems for 911, E-911, and NG-911 networks, systems, and protocols. In this newsletter, we provide a valuable tutorial, and then discuss protocol specifics of legacy, enhanced, and next generation 911 architectures and GL's test solutions for all of them. Emergency services are the backbone of a civilized society. Police, fire, and ambulance are contacted by a single emergency telephone number. In the US that single number is 911. In other countries, there may be a different unique number or several numbers. In the European Union, the number is 112, in others 999, and so on.A person at a Public Service Access Point, or PSAP, usually a governmental agency/service close to the location of the emergency answers the call and dispatches 1st Responders as required. PSTN, VoIP, and Wireless carriers have developed methods for voice connection to the right PSAP and to provide accurate location data necessary for dispatch. The above diagram shows a simplified diagram of the current 911 and E-911 network architecture. 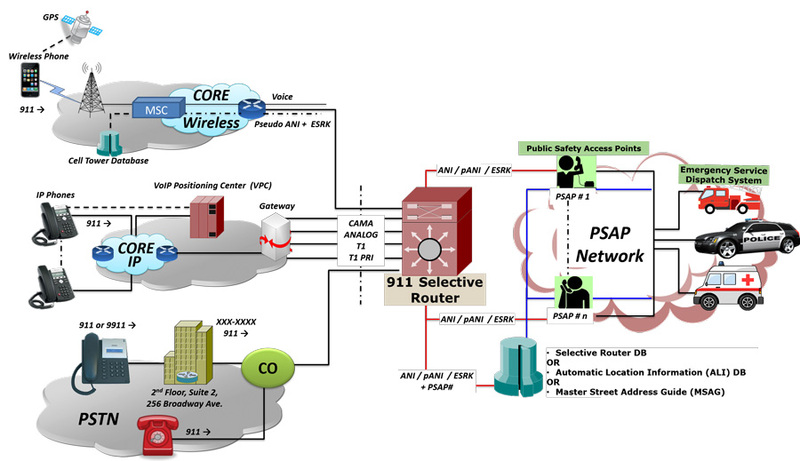 Call flow starts with the carrier network routing the voice call to a 911 Selective Router, which in turn routes the call to the responsible PSAP. This routing is based on an 8, 10, 20 digit # or an equivalent “key” provided by the carrier network to the 911 Selective Router. The PSAP attendant in addition to answering the emergency call also uses the 8, 10, or 20 digit # or the equivalent “key” to access many location databases - Selective Router (SR), Master Street Address Guide, or the Automatic Location Identifier (ALI) - that provide more specific location of the caller (street address, building floor, suite, latitude/longitude, etc.). The abbreviated digits/key are termed ANI, pANI, or ESRK/ESQK, depending on if the call is from a PSTN, VoIP, or Wireless carrier. Automatic Number Identification (ANI) is a 8 or 10 digit landline caller telephone #, that in the conventional PSTN, is an index into the Selective Router (SR) database for the responsible PSAP # and the Master Street Address Guide (MSAG) database for the actual street address of the caller. Wireless callers have no fixed location, therefore a Pseudo Automatic Number Identification (pANI) is provided. The pANI is a code for the location of the wireless caller by cell site/sector in the Automatic Location Identifier (ALI) database. VoIP uses something similar called ESRK/ESQK (Enhanced Services Routing Key) for identifying the specific PSAP # and the caller location. Each carrier network is responsible for maintaining location data for their subscribers, updating the ALI database, and nearest PSAP # , all indexed to the ANI, pANI, ESRK/ESQK codes. In all networks, the SR determines the correct PSAP to connect to, by interrogating databases, and completes the voice connection to PSAP attendant, via analog, T1, FGD-OS, T1/PRI, or SS7 circuits. In the analog, T1, FGD-OS connection cases, ANI, pANI, ESRK/ESQK numbers are transmitted in-band to the PSAP via MF (multi frequency) digits or Enhanced MF if more than 10 digits are required. In the T1/PRI or SS7 connectivity case, these numbers or keys are transmitted via ISDN or ISUP messaging fields. In the section below, we discuss the Part 1: The GL's Test Solutions for 911 Network over PSTN - CAMA, Analog, CAS, and FGD-OS. In the coming weeks, we would discuss on Test Solutions for 911 Network over T1 ISDN & SS7, Wireless, and VoIP. CAMA - Centralized Automatic Message Accounting is a special analog trunk originally developed for long-distance billing but is now mainly used for emergency call services: 911 and Enhanced 9-1-1 (E-911). CAMA trunk connects a carrier switch directly to the Selective Router (SR), a special 911 Switch that in turn connects to many PSAPs. CAMA Signaling Simulation and Monitoring is accomplished using GL's MAPS™ CAS Emulator and MAPS™ FXO FXS Emulator hardware and software applications. Similarly, MAPS™ ISDN Emulator and MAPS™ SS7 Emulator can perform 911 messaging and analysis over ISDN/PRI and SS7. All of these are strictly over a TDM network. 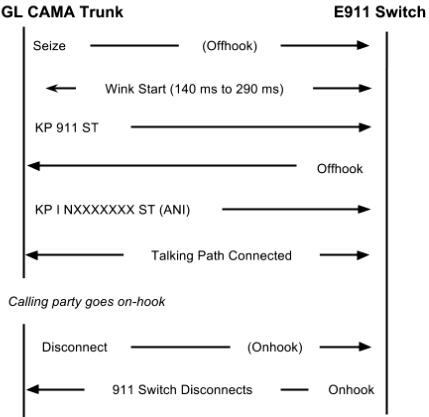 GL's MAPS™ CAS Emulator can be used to simulate CAMA trunks connected to the 911 Selective Router. CAMA type signaling trunks are used to provide the calling party's Automatic Number Identification (ANI) to the Selective Router. The Selective Router then routes the call to the appropriate Public Safety Answering Point (PSAP) based on the calling party's location. Both analog and digital (T1) CAMA simulations are supported. Analog simulation requires an additional channel bank specially configured for CAMA. Also, GL's MAPS™ CAS Emulator application can be configured for emulation of 911 services. CAMA emulation capabilities include - seizure and wink start detection, onhook and offhook detection and MF digit (ANI) generation/detection. 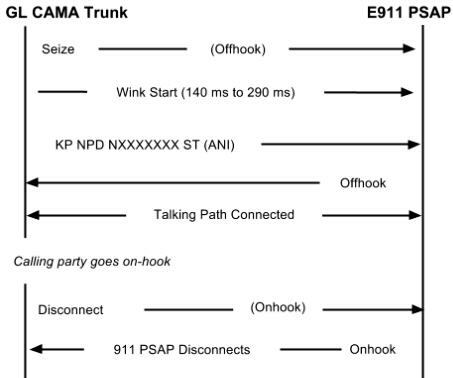 The below figure illustrates a typical FXO CAMA signaling scenario where MAPS™ CAS simulates the CAMA trunk connected to the 911 selective router. CAMA type signaling is used for sending the calling party's Automatic Number Identification (ANI) to the 911 selective router. 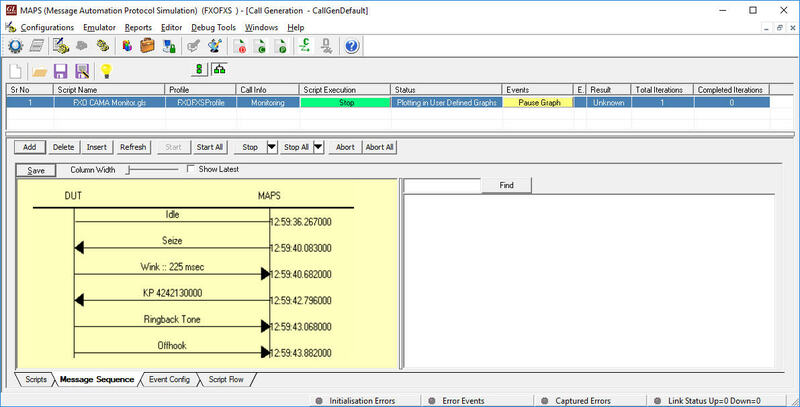 MAPS™ CAS Emulator application displaying a real-time signaling sequence of the CAMA type trunk connected to the 911 Selective Router. 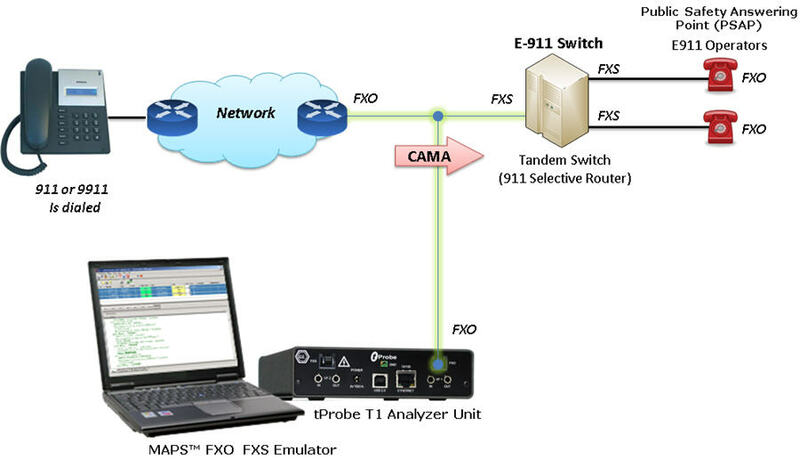 The tProbe™ FXO port can be tapped onto CAMA-type circuits for non-intrusive monitoring of 911 service. Monitoring capabilities include seizure and wink start detection, onhook and offhook detection and MF digit (calling party ANI) detection. A normal analog call is routed based on the destination (called party) phone number. However, 911 calls are routed based on the calling party number. MAPS™ FXO FXS Emulator displaying a real-time ladder diagram of the CAMA type trunk signaling sequence as captured by the FXO port. Typically, there are 5 CAMA signalling types based on the number of digits in ANI, these include, 7-digit transmission (kp-0-nxx-xxxx-st), 8-digit transmission (KP-npd-nxx-xxxx-st), 10-digit transmission (kp-0-npa-nxx-xxxx-st), 20-digit transmission (kp-0-npa-nxx-xxxx-st-kp-yyy-yyy-yyyy-st), and kp-2-st (indicates a failure to receive ANI). A live graphical view of the captured line voltage is displayed in below User Defined Graphs.